•	Right now, you can choose from more than 12,000 charities. Soon we aim to enable you to choose any UK registered charity. •	For this service, and the support we provide we charge a transaction fee of 5% on the donation. •	Minimum age - If you are under 16 years of age, parental guidance is required when you use our service •	Data Protection - We will never share your personal information with anyone without your express permission, except where we are legally required to, or where we need to do so to process your donation. •	Expiry – The sooner you redeem your gift card, the sooner your chosen charity will benefit. Unused cards expire after twelve months, with the value being donated to a charity of our choice. •	Not transferrable for cash. •	Consents - We will never send you marketing offers unless you have expressly given us your permission to do so. And if you later decide that you don’t want us to send you any more offers, we will stop. The Gift of Giving Not many gifts can changes lives but this one can. The new gift card from For Good Causes gives the recipient a donation to make to the charity they love the most. Whether they support one of the well known, global charities or even their local hedgehog sanctuary, it’s their choice. With the For Good Causes gift card, they can choose from over 12,000 registered UK charities (soon we aim to enable the choice from ANY UK registered charity). Not only will you be putting a smile on the lucky person’s face, you’ll also be helping raise a whopping £100m for charity from For Good Causes over the next few years - life changing. For Good Causes is finding new ways for people to donate to the charities they love and are also letting people turn their loyalty points, airmiles and cashback into donations. www.forgoodcauses.org. 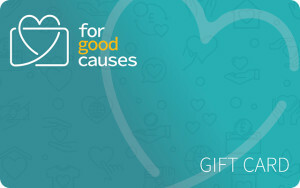 To redeem your eGift visit https://my.forgoodcauses.org and enter your gift card number and follow the simple steps to complete your donation and benefit your chosen charity. You can also reach this page by clicking "Get Gift" in you email then clicking on the the "Redeem Gift Card" button.